(καïάφας, a Greek word; in the Hebrew original, probably not , but ; compare Mishnah Parah iii. 5; Derenbourg, "Essai sur I'Histoire de la Palestine," p. 215, note 2; Schürer, "Gesch." 3d ed., ii. 218; Josephus, "Antiquities of the Jews," xviii. 2, § 2): Son-in-law of the high priest Ananas or Annas, mentioned in John xviii. 13; held that office himself through appointment of Valerius Gratus, about 18-36, hence for a longer period than several of his predecessors and successors. Luke iii. 2 speaks of two high priests, Annas and Caiaphas. The mention of the two at one and the same time has been a great stumbling-block to the commentators. John made a curious error (xi. 49, xviii. 13) in speaking of Caiaphas as the high priest "in that year," as if he interchanged every year with Annas. It appears that even while Caiaphas performed the duties of the office, the power of high priest lay in the hands of Annas. Caiaphas' historic importance lies in the fact that he is expressly mentioned by Matt. xxvi. 3, 57, and John xi. 49, xviii. 13, 24, 28, in connection with the crucifixion of Jesus, though not by Mark and Luke. After his arrest, however, Jesus was taken not to Caiaphas but to Annas (John xviii. 13 et seq. ), who questioned him only privately. The actual trial took place on the next day, the eve of the Passover, before the twenty-three members of the Sanhedrin over whom Caiaphas presided (Matt. xxvi. 57). Caiaphas is reported to have said on that occasion that it was expedient that one man should die for the people (John xviii. 14), a saying found also among the Rabbis (Gen. R. xciv. 9). The fact that Jesus was taken not to Caiaphas but to Annas is explained on the ground that the latter's palace was nearer the place of arrest than that of the former. Through the travels of Theodosius Archidiaconus, 530, it is known that there were 100 paces between the house of Caiaphas and the hall of judgment ("Nuovo Bull. di Arch. Crist." vi. 184, Rome, 1900). Peter and other disciples, however, being ignorant of the state of affairs, went to Caiaphas' house in the night. After Pontius' recall Caiaphas was removed by the new governor, Vitellius (Josephus, "Ant." xviii. 4, § 3), and was succeeded by Jonathan, who was the son of Anan (36) and perhaps a brother-in-law of Caiaphas. 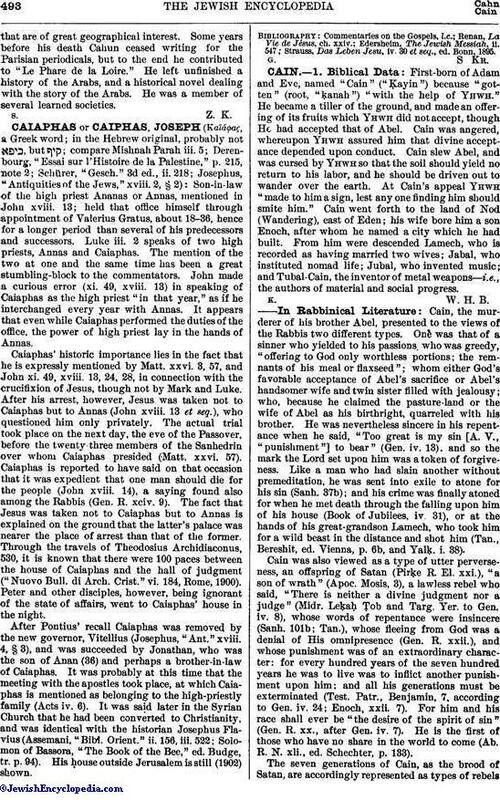 It was probably at this time that the meeting with the apostles took place, at which Caiaphas is mentioned as belonging to the high-priestly family (Acts iv. 6). It was said later in the Syrian Church that he had been converted to Christianity, and was identical with the historian Josephus Flavius (Assemani, "Bibl. Orient." ii. 156, iii. 522; Solomon of Bassora, "The Book of the Bee," ed. Budge, tr. p. 94). His house outside Jerusalem is still (1902) shown. Strauss, Das Leben Jesu, iv. 30 et seq., ed. Bonn, 1895.